An open tour to bring your friends or meet new friends from other parts of the world. Silently glide along Costa Rica’s Gold Coast while passing some of Guanacaste’s exotic bays, white sand beaches and tropical jungles. Gaze off the bow with a cold tropical drink prepared and served by our crew as you scan the seas for dolphins, sea turtles, flying fish or even a breaching whale. Stop in a tranquil bay, drop anchor and frolic in the blue Pacific. Snorkel in the bay or run down the deserted white sand beach while the ever helpful crew prepares a feast of chicken or pasta salad, fruit, chips, pico de gallo, guacamole and homemade chocolate chip cookies. The Marlin Del Rey Sailing Catamarans will set sail and you will hear the waves slide along the giant catamaran as the sun sets, illuminating the clouds left in the sky. 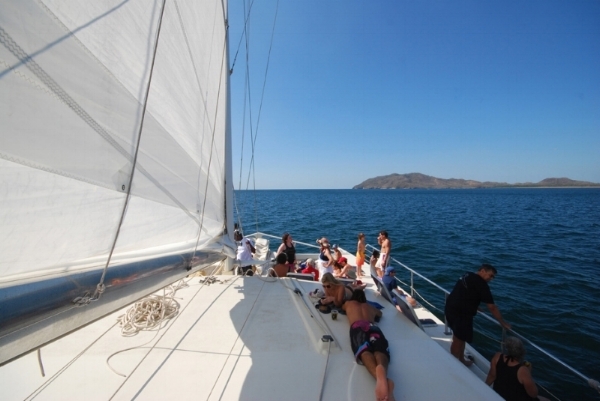 Bring your camera and capture the moment everyone throughout the world talks about when on board the Marlin Del Rey Sailing Catamarans.